Patrick Smyth from Santa Fe, New Mexico and Kimber Mattox from Eugene, Oregon successfully defended their titles to capture the 8th annual Paul Mitchell XTERRA Trail Run World Championship half-marathon on a gorgeous day at Kualoa Ranch in Kaaawa, Hawaii on the Island of Oahu. December 6, 2015 (Kaaawa, HI) – Patrick Smyth from Santa Fe, New Mexico and Kimber Mattox from Eugene, Oregon successfully defended their titles to capture the 8th annual Paul Mitchell XTERRA Trail Run World Championship half-marathon on a gorgeous day at Kualoa Ranch in Kaaawa, Hawaii on the Island of Oahu. It’s the third title in as many years for Smyth, “the fastest man on dirt”, who is also a two-time XTERRA USA Champion and has won back-to-back U.S. Trail Half-Marathon titles as well. “That was a lot of fun,” said Smyth, who took the lead early and never let up. His winning time of 1:20:16 was four minutes slower than his winning time last year, but still two-minutes faster than runner-up Daniel Jones, the XTERRA New Zealand National Champ. Smyth won’t have long on the islands to enjoy his three-peat as he heads back to New Mexico and his full-time job in computer mapping tonight so he can be back in the office tomorrow. Smyth now turns his attention back to the road with a build-up to the Olympic marathon trials in Los Angeles, California in February. As for Jones, he knew what he was up against running with Smyth, and said he was “beyond stoked” to cross the line in second. “I raced Pat’s teammate in Brazil a few weeks ago and so I knew Patrick would be the one to beat, especially when he took it out at the start. He was next level compared to the rest of us, and it was a good experience to race against him.” said Jones, who comes from the same home town, Whakatane, of this year’s 15-19 XTERRA World Champion triathlete Hayden Wilde and other well-known multisport racers like Sam Clark. Jones, who graduated with an MBA in finance from Sam Houston State University in Texas in May, will get to work on his career as a financial analysis for PWC in Wellington, New Zealand this February. Alex Pilcher from Derby, Great Britain finished in third in 1:28:30, six-minutes behind Jones. Florian Neuschwander from Germany and Niam Macdonald from New Zealand finished fourth and fifth, respectively, in 1:29:31 and 1:34:19. As proof of the international status of the XTERRA Trail Run World Championship, runners from six different countries landed in the top 10. In the women’s race Mattox pretended she was a dinosaur from the Jurassic era running wild through the jungles to propel herself to another XTERRA World Title. Mattox indeed had company early as the 2012 XTERRA Trail Run World Champ Polina Carlson ran nearly stride-for-stride with Mattox through the first 10 miles. Mattox, who like Smyth is a member of the U.S. Mountain Running Team and placed 6th this year to help Team USA to a bronze medal, said she had to remind herself to just keep moving forward. Mattox finished with a winning time of 1:36:44, nearly four-minutes ahead of Carlson who placed second in 1:40:24. “It was a lot muddier but amazingly I only fell one time this year. The climbs are tough but I love how you pop out and you’re looking over the ocean. It gives you a little reward at the top of each hill. It was fun to be out there with Polina too. I felt like I was working with her and that was really fun, a really great experience. I was also thinking about Christmas, and that when I got to that line it was Christmas vacation for me,” said the USATF Trail Half Champion. For Carlson, she said that even though she finished second it was still her most enjoyable race. “It was such an amazing event, so much fun. Trail running, especially out here, is so unpredictable and it was extremely muddy which was the most challenging part for me. I crashed at least 15 times, can’t you tell,” smiled Carlson, as she looked down at her mud-covered body. Coming in third was Penelope Freedman of Steamboat Springs, Colorado, in 1:47:18. Reegan Ellis from Newport, Australia finished fourth, just edging Ashley Jensen from Boston who rounded out the top five. The 2015 class of XTERRA Trail Run World Champions features 28 men and women from six different countries and 10 U.S. states. Standing out among them was Hawaii’s own Ed Bugarin, who won his fourth XTERRA Trail Run World Championship. Bugarin won his first world title in the 55-59 division in 2009, he won two in the 60-64 division, and now he’s got his first in the 65-69 age category. Wilhelm Northrop picked up his third title in the 45-49 division, and Nancy Andrade (Kapaa), Ellis Andrews (Penticton, Canada), Dan Walker (Haleiwa, HI) Kasuga Watabe (Kanagawa, Japan), and Christian Friis (Malmo, Denmark) all collected their second world championship crowns. One of the more remarkable performances came from the 12-year-old Watabe, who not only won the 10-14 division in 1:3:16, she also finished seventh overall among all women. Also of note, Hawaii Sport Magazine founder/editor Christian Friis is back in Hawaii and ran XTERRA Trail Run Worlds for the eight straight time. 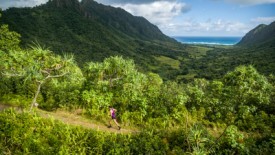 Above all, Kualoa Ranch was once again the star of the show, providing trails and views that are one-of-a-kind. In addition to the 21K championship course, there were also 10K and 5K races staged at Kualoa Ranch on Sunday. Nathan Carlson (husband to Polina) from Kailua won the 10K race in 36:11 and Phaelen French from Warner Robins, Georgia was the women’s winner (5th overall) in 44:58. Kevin Enriques from Honolulu placed first in the 5K for the third year in a row with a time of 20:27, while Laura Simons from Kailua was the top female in 26:17. The Paul Mitchell XTERRA Trail Run World Championship is sponsored by Outrigger Resorts, XTERRA Travel, PowerBar, the Hawaii Tourism Authority, Kualoa Ranch, Gatorade Endurance, Trail Runner Magazine, LifeProof, Hawaii Sport Magazine, Muscle Milk, XTERRA Fitness, Optic Nerve Sunglasses, XTERRA Boards, and Greenlayer. TEAM Unlimited is a Hawaii-based television events and marketing company, founded in 1988. It owns and produces XTERRA and in 2015 offered more than 300 XTERRA off-road triathlon and trail running races in 30 countries worldwide. In addition, TEAM TV has produced more than 400 adventure television shows resulting in three Emmy’s and 42 Telly Awards for production excellence since 1990. View samples at www.xterra.tv, and learn more at www.xterraplanet.com and www.xterratrailrun.com.